Crabs are a large family of decapod crustaceans. 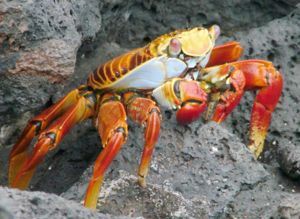 There are hundreds of species, mainly marine, although freshwater species such as the Chinese mitten crab, and land-dwelling species such as the robber crab (which climbs coconut trees to feed on the nuts), also exist. The Alaskan king crab is the heaviest species of crab, but the Japanese spider crab has much longer legs, sometimes spanning ten feet or more. The smallest species of crabs are the pea crabs, that live as commensals inside the shells of many bivalve molluscs. Crabs are typically omnivorous, feeding primarily on algae, but happy to scavenge or capture live prey when available. Crabs are themselves the common prey of many marine organisms, including cod, cuttlefish and octopuses. Crabs are an important fishery in many parts of the world. The horseshoe crab, Limulus, is not actually a crab, or even a crustacean. Crabs were known to the Ancient Greeks, as evidenced by the existence of a crab constellation, Cancer, which is also one of the twelve signs of the zodiac. This page was last modified on 28 February 2012, at 09:47.